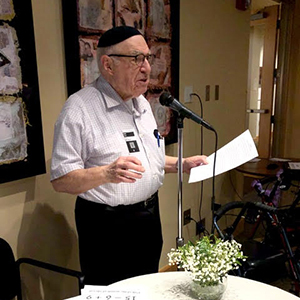 One could feel the warmth and pride in the social room at the Summit when Hadassah volunteers, organized by Rochelle Kochin, reached out to the residents to let them them know how much we value them. 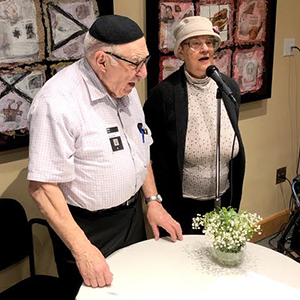 Serving them their plates filled with fruits and nuts with an extra helping of kindness, offering wine or grape juice, and sitting one or two volunteers at each table to visit with the residents, these older members of our Jewish community soaked in the attention being showered on them. The following Hadassah volunteers answered the call to put into action one of Hadassah’s underlying Jewish values, Gemilut Chasadim, Deeds of Lovingkindness: Meryl Alcabes, Debbie Aylott, Elisa Azose, Janice Cohen, Ettie Davis Ilana Golan, Bev Horwitz, Shira Katsman, Hadar Katsman, Rochelle Kochin, Marilyn Leibert, Nancy Lichter, Debbie Robinson. There will be more opportunities for volunteers at The Summit. Please let us know here if you want to be on the list for March. 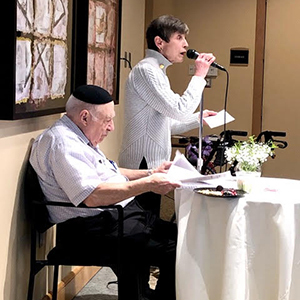 Hazzan Ike Azose led this beautiful Sephardic Fruitikas Ceremony. He called on Ettie Davis to speak for Hadassah. When asked how long she has been president, she admitted it was only eight days, but Hadassah has a long history of being the largest organizational supporter of the Jewish National Fund (JNF), planting trees to reclaim the land to forests and fruitful fields. Hadassah’s current project, a forest in the desert, is part of the Beersheba River Park Project.